Departure: Tour starts at your location around 7.30 am on the first day. • The price includes entrance fees, motorbikes, food and drinks. • The price is subject to change due to Vietnam’s public holidays. You may contact us for further details. 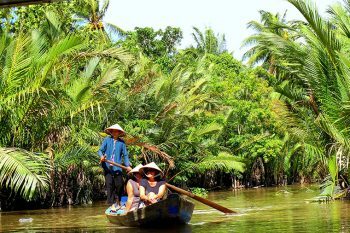 Please note that this tour is designed as a self drive Mekong delta tour where you will be guided by one of our knowledgeable team. It is the responsibility of the client to ensure that they are compliant with local motorbike license regulations. We can discuss this with you at the time of booking. If you would like to do the tour as a pillion rider, contact us for more details. – Bike damage (e.g. broken levers, heavily bent rims/handlebars/frame, burnt out clutch plates due to improper gear use). – Personal travel insurance or emergency transportation. -For 250-400cc motorbikes, contact us for more details. -Single room booking, you shall pay an extra charge equal to 20 USD/day. 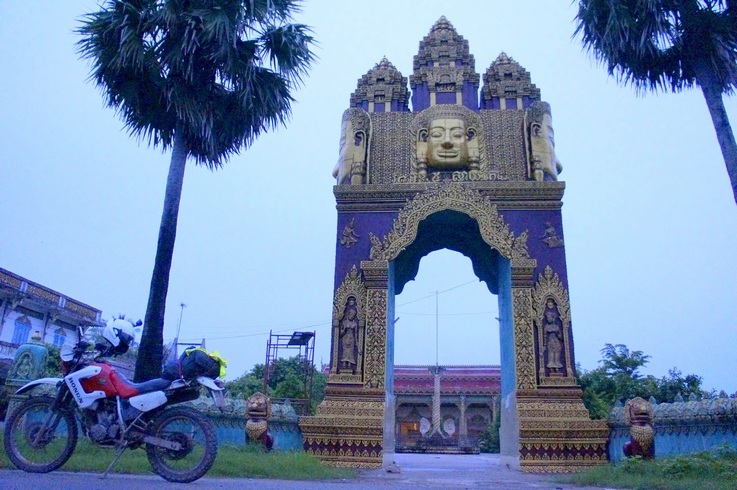 -If you request to have a truck and a truck driver to carry your luggage, you shall pay 150 USD/Day/truck.If you wish to depart/arrive at any other location except Saigon, the surcharge for bike shipping varies from 80-120 USD/bike. 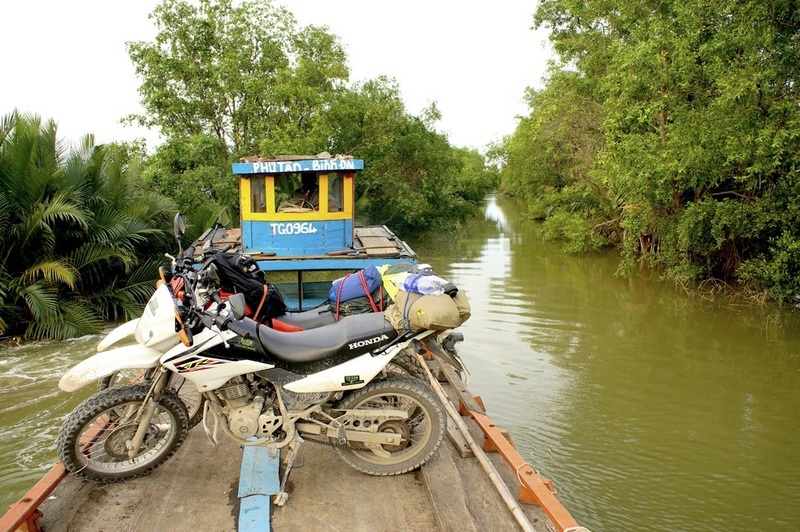 A self-driving Mekong delta tour where you will be guided by one of our skillful and knowledgeable teams. 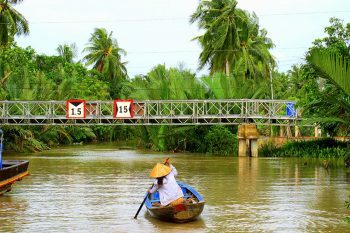 You will be amazed from adventures, culture, local people and food in this wonderful 6-day Grand Mekong delta loop. Before departure we’ll go through a mandatory test of our equipment, checking gears, brakes and safety wear etc to ensure we are ready for the travel ahead. After that all we need is some riding skill, a Gopro or smartphone camera and most importantly, a good dose of adrenaline. That’s enough to get us going. A variation on our popular estuaries of the Mekong delta tour that gives you a more comprehensive look at the whole Mekong delta. 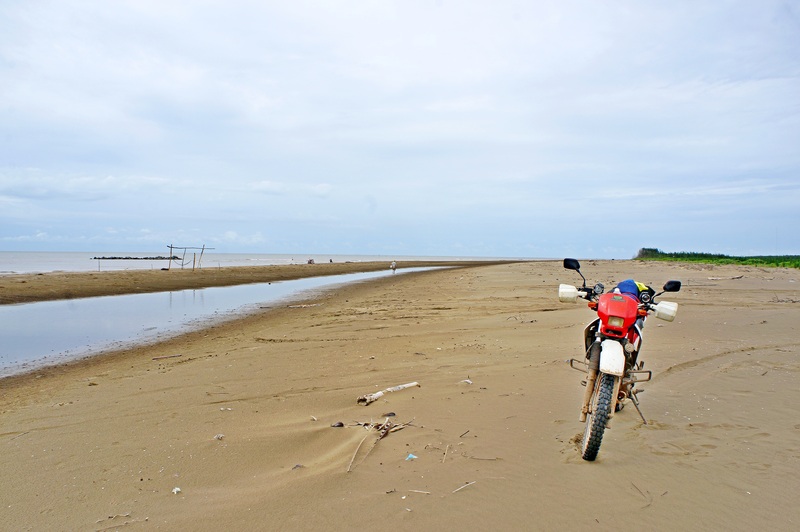 A dirt bike tour that takes you not only through the heart of the Mekong allowing you to appreciate how fundamental are the rivers of the delta to the lives of the folk who live here, and to see the stunning beauty of U Minh Thuong National Park and the coastal province of Kien Giang. Mekong, a single word that evokes such tremendous feelings for nearly twenty million Vietnamese living on its delta. For locals, it’s their everything! The river was called “gift of water” by the famous French adventurer Jacques Cousteau in 1993. Cousteau spent a memorable time going up and down stream to capture and present to the world the Mekong’s rich array of resources and varied civilizations. You can watch Mekong delta via Cousteau to see more of this land existing simultaneously in the present and past. 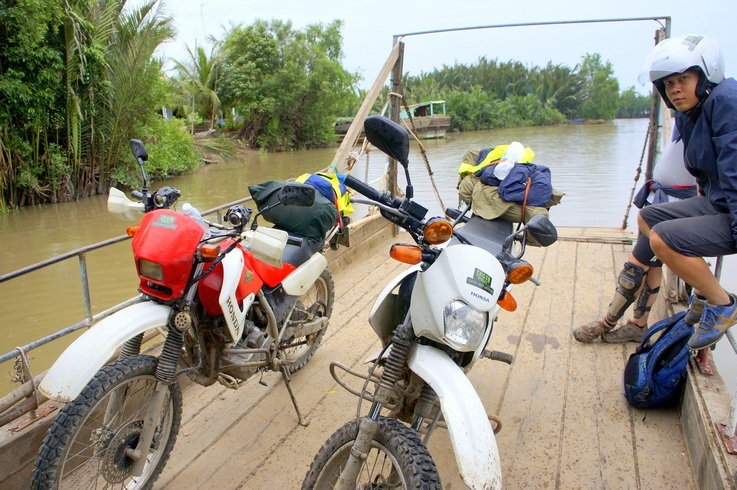 Our expedition stretches not only along the river like Captain Cousteau before but also across its many estuaries, on two wheels, as close to the water’s edge as possible. 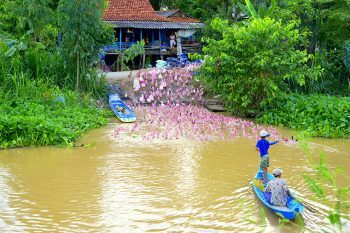 Ben Tre is a big fertile island province carved by several of the main branches of the Mekong river. During the Vietnam War, spontaneous uprisings in Ben Tre spread resistance and conflict to many other areas of South Vietnam. Now it’s the centre of a famous coconut, topiary and bonsai industry, and fishing and aquaculture. Our guide will meet you at 7.30am and depart to the south of Saigon to the bumpy roads through wooden boat yards, past shrimp farms and mangrove before crossing the first mouth of the Mekong. More riding through the scenic rural ideal before a late morning river crossing followed by a lunch break in a fishing town. Like many fishing towns and villages, an array of piers and wooden structures are dotted along the water’s edge. These are the landing places for the many small fishing vessels and the hive of activity is a great chance to take some great photos of local fish trading activities. Later is the time to test your skill by riding on tight trails and across narrow bridges with no handrails. Overnight stay will be in a guest house in a small town on the main island of Ben Tre province. As we don’t pass through any urban area of substance on the first day, the accommodation is modest and local. If you need a more comfortable upmarket hotel room, don’t hesitate to ask us to rearrange the route for a suitable accommodation. • Tip of the day: Fill up your belly and mind with caffeine and energy drinks as required and take the time to have small talks with locals on the ferry crossings. Today we pass through the provinces of Soc Trang and Tra Vinh where Khmer communities have dominated this isolated wet land for centuries before the immigration of the Viet and Chinese. They all contribute the prosperity to this land through farming and trading and enrich Vietnam culture through religious ceremonies, festivals, beautiful temples and monasteries. 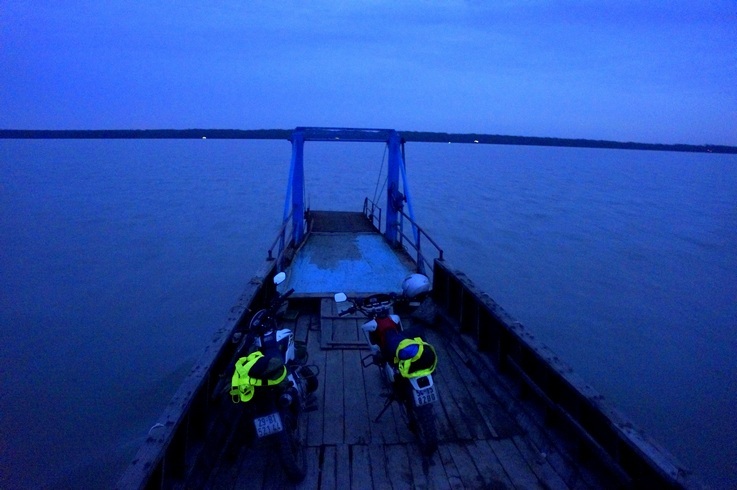 We will ride through sleepy Khmer hamlets, passing by countless shrimp farms and witness the shrimp harvest. Today will be filled with river crossings by ferries of all size and shape bringing and an array of interesting challenges. 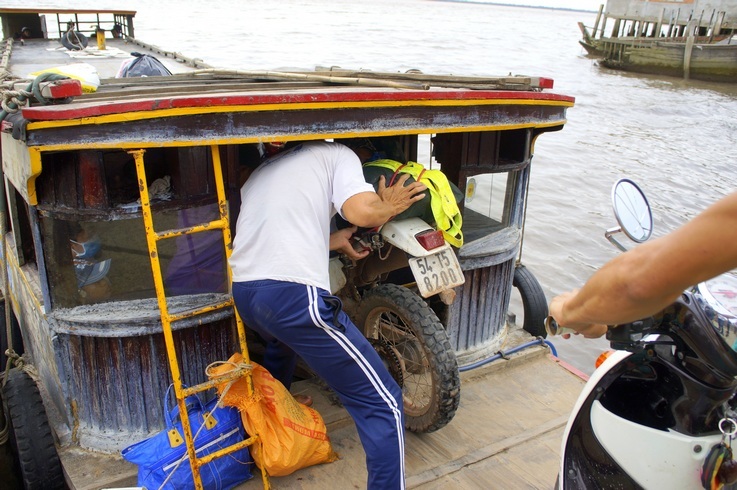 Please note that we are the first and the only company providing this type of tour to the Mekong estuaries, expats and foreign tourists are rarely seen all along the way we ride. So take the opportunity to interact with locals on ferries and food and drink stops. It may provide you with one of the most genuine and interesting parts to your visit to Vietnam. A real conversation piece. • Tip of the day: Don’t fall in the water and watch out for chooks and pets. Keep your camera battery charged – a long lens camera is a good option for the visit to U Minh Thuong. Get ready to taste exotic food at the national park. We start the day with a visit to Mahatup pagoda. It’s a large pagoda with Khmer origins; it’s also known as Bat Pagoda because it is home to a colony of giant fruit bats. We then depart Soc Trang heading to U Minh Thuong National Park. The concrete pad roadway tracing its way through the villages en route has countless narrow bridges making it a great challenge for any rider. 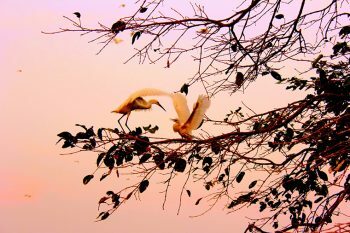 U Minh Thuong NP is one of the richest areas of biodiversity in the country and a wetland of international importance, highlighting an array of mammals, fish and waterbird life native to the Mekong delta. We’ll take lunch before we cruise a shrimp tailed boat along the canals to the bird reserve located in the core of the national park, a highlight of this 3rd day. After the visit to the NP we continue to our overnight stay in Rach Gia. 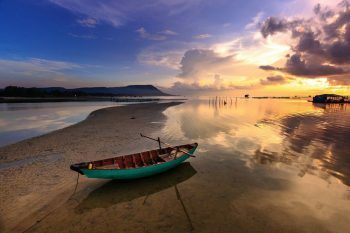 • Tip of the day: You can choose one of two options, which is heading to Phu Quoc Island or returning to Saigon. After taking an early breakfast in your hotel, we will transfer and board the express boat, the Superdong, to Phu Quoc island. Daily departures at 7:30 am and you will dock at the main pier in the island at 10 am. Departure from Rach Gia is included in our service. Tips of the day: Be prepared for an emotional visit to Ba Chuc massacre site. A fully charged battery camera is highly recommended and a long-lens camera is a good one for the low-lands and Tra Su. • Tip of the day: Be prepared for an emotional visit to Ba Chuc massacre site. Once again have your camera fully charged and a long lens camera is a good option for the low lands and Tra Su. We leave Rach Gia on the back roads, through vast rice paddy country on the way to Ba Chuc massacre site. It was here in 1978 that units of the regular army of Democratic Kampuchea’s army, the Khmer Rouge, emboldened by their victory in Cambodia, spilled over the border massacring thousands of local villagers, leaving only two survivors. The memorial and pagoda erected at the site is a poignant reminder of those attacks and stands alongside Tuol Sleng, the Killing Fields and My Lai amongst others as haunting testaments of the depravity of that time in south east Asia. • Tip of the day: Experience the cultural diversity of Chau Doc and the rich bounty of the upper reaches of the Mekong. We start the day by a visit to a fishing village and fish farm nearby Chau Doc. Its all raw and rural but the people here are proud of their product, be it rice or basa fish as its top quality and exported worldwide. 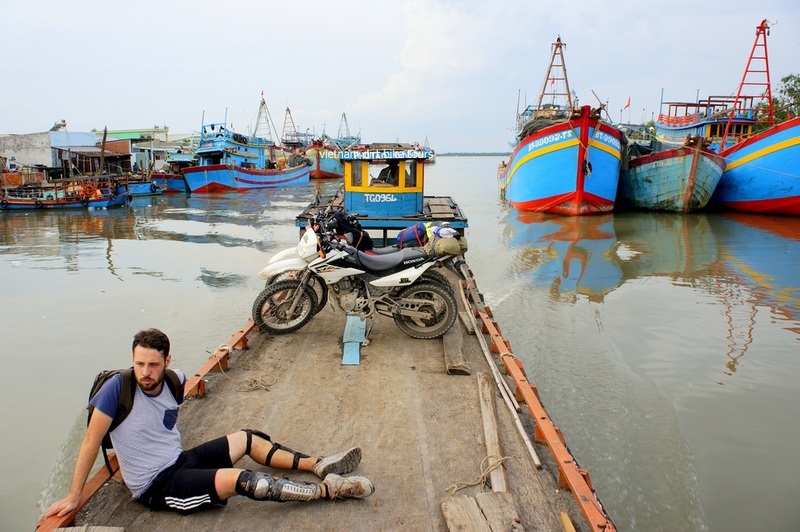 From here our motorbike ride takes us through rice paddies, villages consumed with producing straw mats and citrus farms along trails that take us to the largest city in the delta, Can Tho. After all the riding through the rural reaches of the Mekong, stopping at a large city like Can Tho sounds like a jarring experience contrast, but it’s a little-big city, with all the facilities of a city but a pace that hasn’t changed for a hundred years mirroring the pace of its rural surrounds. After checking into our accommodation for the night, we’ll do what many locals do in the evening and head to the riverside promenade for some relaxation. • Tip of the day: The best floating market experience in the Mekong delta – remember to charge that camera and get up close to the locals. We continue to explore the waterways with an early morning boat ride to the bustling Cai Rang floating market, the biggest in the Mekong delta. As we weave amongst the anchored boats, we’ll see vendors line up their boats and hang fruit and vegetables on a bamboo pole to advertise the goods they are selling. Moving on from the floating market we will visit an inland market to compare the differences as well as a nearby noodle factory. After that, it’s time to explore the land with a ride through farming villages and small laneways on the way back to Saigon. We can stop as often as you like and there will be plenty of impromptu breaks to meet up with lots of friendly locals. Something you wont get from the package coach tour out of Saigon. 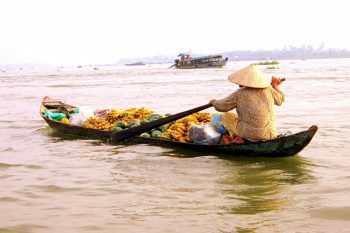 Whether continuing your Vietnam holiday with a trip north or flying home, you will leave the Mekong delta with fond memories of the friendly locals, colorful markets and vibrant scenes discovered on this tour.